This summer, my bestie and I went to a store where you could paint pottery and make candles. After the first mug I painted, I was hooked and my artist fire had been lit! I found out my local art studio also had pottery painting available so in August, I decided to stop by and check it out. As soon as I walked through the doors, they were incredibly welcoming and the space was the perfect place to create. The item I chose to paint was this a lovely round plate. I decided to experiment with multiple colors of glaze as a base. It took a very long time to paint because you need to do about 3 coats of the color to make sure it doesn’t show brushstrokes after it is fired. It was hard to make sure your third coat was strong on the edges of the shapes I was creating. I had to wait for the background to dry before I could use a water-soluble marker to draw my doodles. When I tried to draw on it before it had dried, it pulled up the glaze. 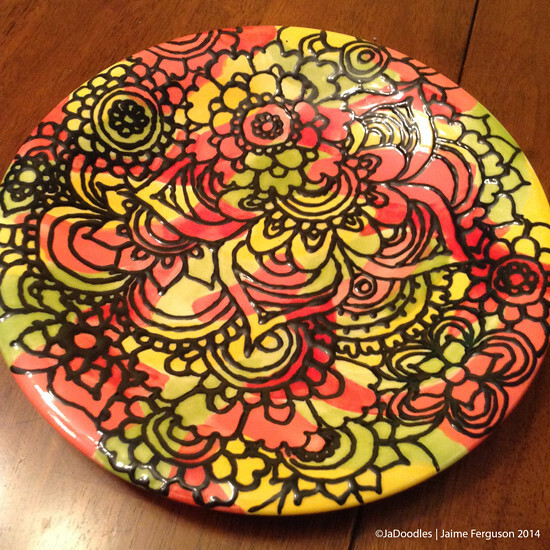 When I was able to stop in another day, I freehanded my doodle flowers onto the plate using the water-soluble marker. I wanted to cover it in flowers, but I realized it was going to take a lot of brush work to make sure it was all outlined. One of the gals, Megan, had suggested I use a bottle that came to a point (reminds you of those puffy paint bottles but it is full of glaze). It was hard at first because I was having trouble controlling how much glaze came out of the bottle, but it was complete in a matter of minutes. After a week, I was able to pick up the plate and I was excited to see how it turned out. When you first paint the glaze, it is more pastel in color than what it will really be after it has been glazed and fired. 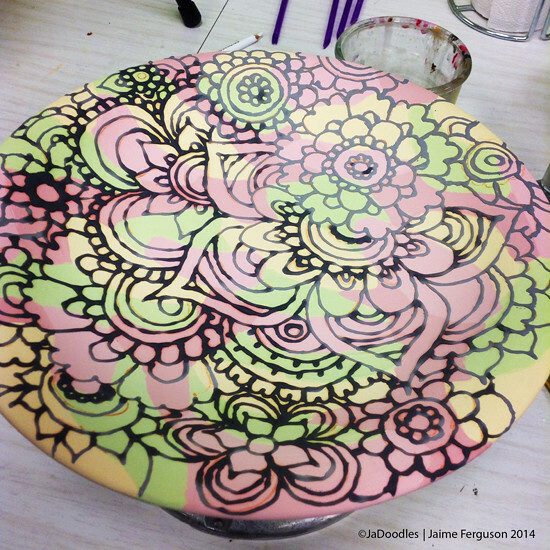 It was definitely more colorful than before, but the lines bled a little because of using the bottle of glaze. It does create slightly raised lines too which makes the plate feel neat, but I still say it was a successful experiment!